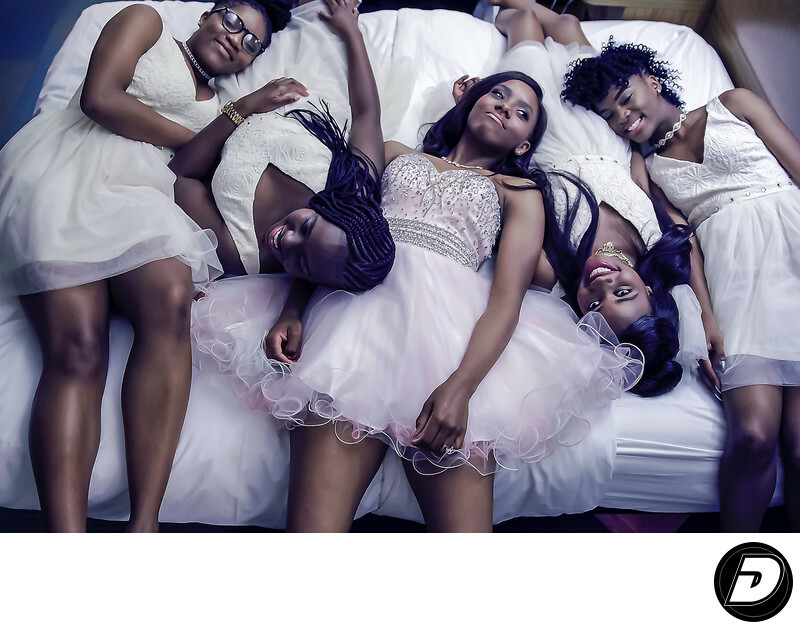 Harlem Aloft Sweet Sixteen Photographer captured, the five young women laying across the bed a the Aloft Hotel in Harlem sweet sixteen coming of age celebration of a female sixteenth birthday. Although it is common that sweet sixteens are mostly celebrated by girls, they can also be celebrated by boys. Sweet sixteens can range from modest parties at home with close family to large affairs with a hired DJ, makeup, hair styling, expensive gowns and dresses, and hotel ballrooms. Similar celebrations are found in different cultures around the world, such as the quinceañera in hispanic countries and the festa de debutantes in Brazil, both at 15 years of age. Much like a wedding, this event can be formal, casual, or semi-formal. Even if it is a small party, the main purpose of the party is to celebrate the person becoming "older" and entering a different stage of their life. Typically this is the last big birthday party a teenager would have. Location: 2296 Frederick Douglass Blvd, New York, NY 10027. 1/80; f/2.8; ISO 1600; 25.0 mm.